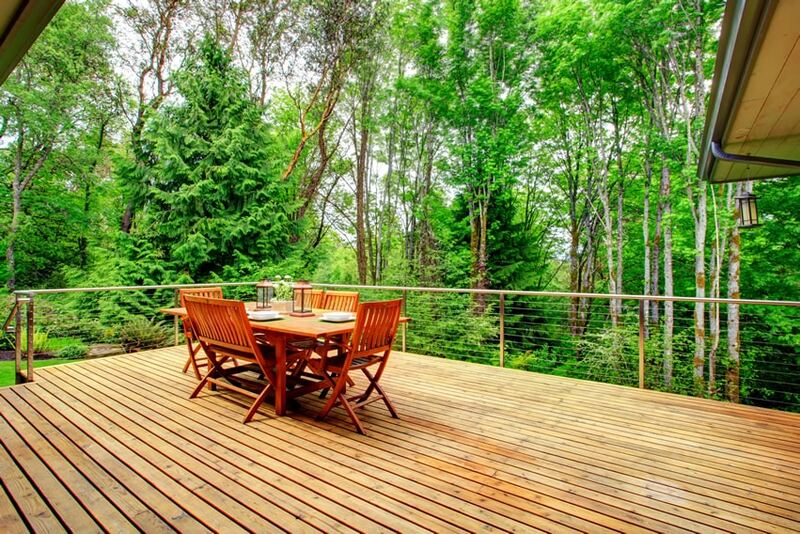 Welcome to our gallery of beautiful wood deck design ideas for a variety of home styles. 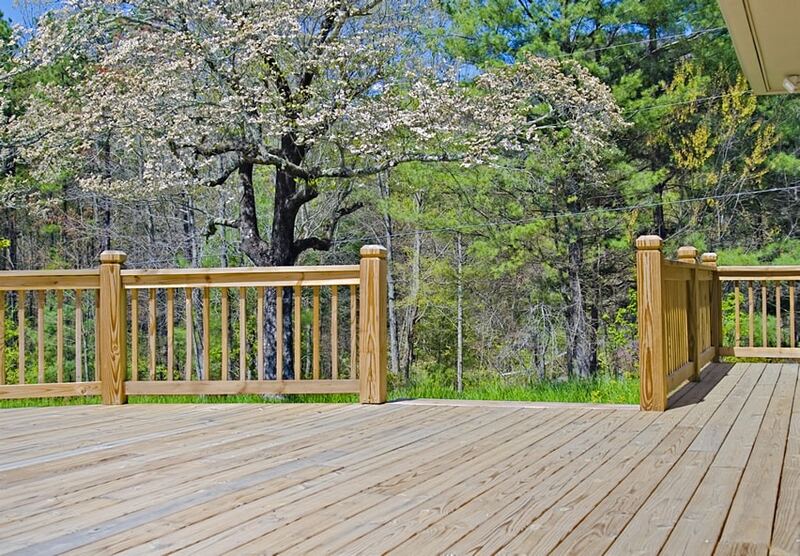 Adding a deck to your home is a relatively inexpensive way to expand its living space and add to its beauty and value. Before you begin your design it is important to consider the primary uses it will serve, whether it’s socializing, relaxation , or outdoor dining. 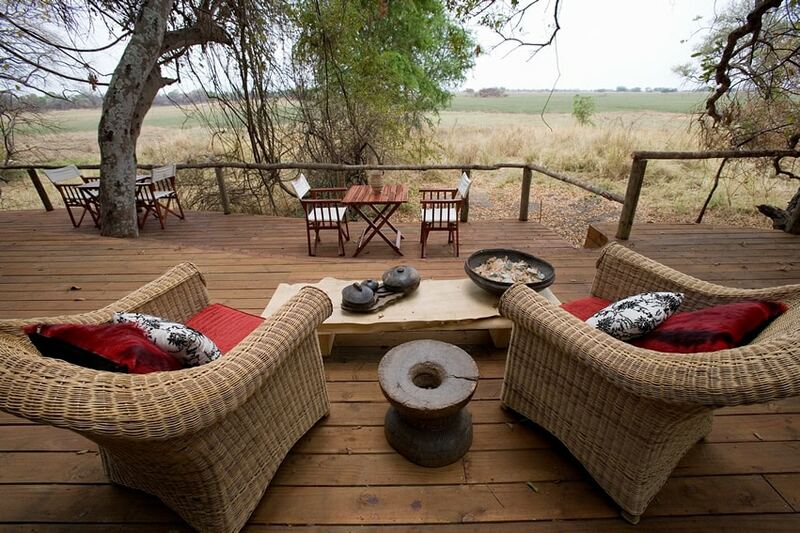 A deck should also be positioned to best take in the views you want to capture, or avoid. Further, you’ll want to consider what type of deck will match your home’s style, available space and patio or garden area. 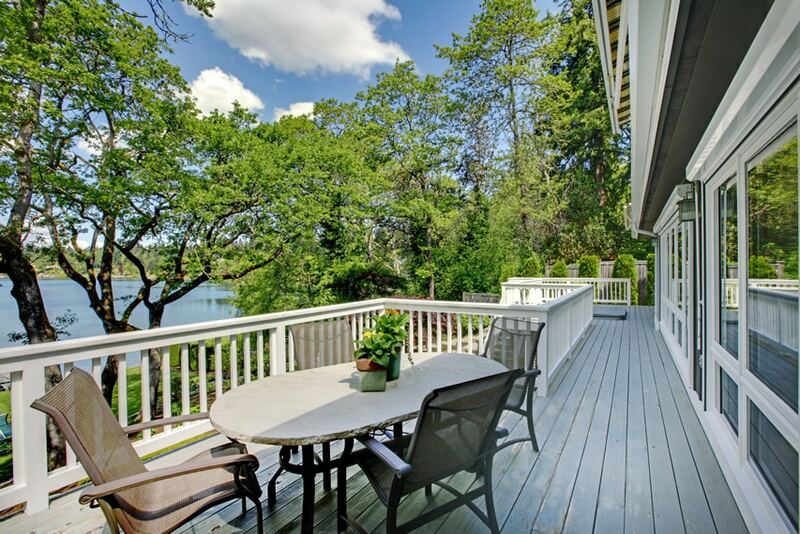 The image above features a large raised patio area with a gorgeous lake-side view which uses Colonial Maple wood deck with white balusters and black-tinted glass railings. It also has Maple wood furniture and large folding umbrella. Angular Decks – For those who want to avoid the square corners of a conventional design. Angling the corners of your deck can give it an interesting design flair and increase its attractiveness without spending a lot of money. Inside Corner Decks – This is a smart choice for U-shaped or L-shaped homes that allows one to maximize their space while adding privacy and intimacy from the home’s walls. 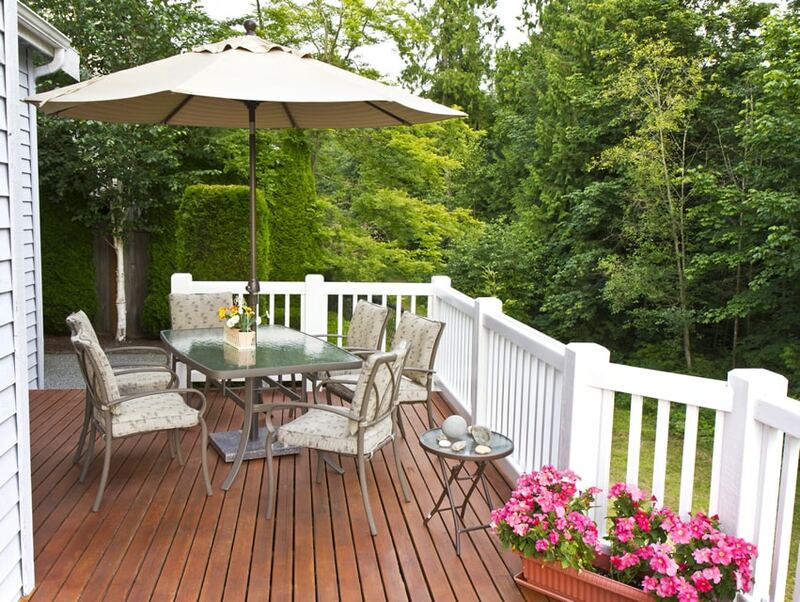 Island & Peninsula Decks: Not directly attached to the house, this style of deck can be placed anywhere in the yard. It is often used to create an inviting space below a favorite tree or in a place to capture the best views. Multi-level Decks – This style is often used for multi-level houses or for those with sloping or irregularly shaped yards. These decks consist of two or more sections connected by stairs or walkways. Platform Decks – Often sitting at or near ground level this design works well for single-story homes and integrates well with landscaping. Raised Decks – Great for adding outdoor space to an upstairs bedroom, this style can help you maximize your homes views. In addition this design works well for those with sloping yards. 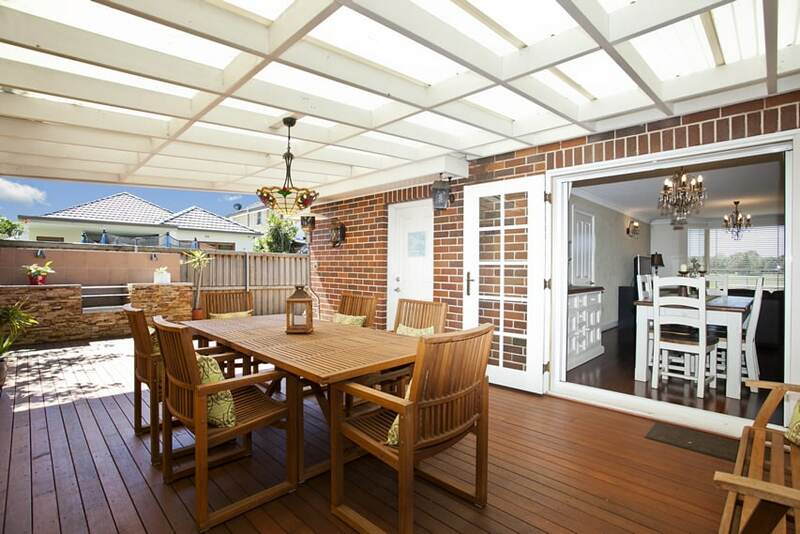 Rectangle Decks – This classic style is one of the most popular choices and is often used to add decking across some or all of the back of a home. Round & Curved Decks – By eliminating hard edges with this style you can give your deck a attention grabbing distinctive look. Square Decks – Versatile shape that will fit most houses. This design is easy to build and a great choice for those on a limited budget. 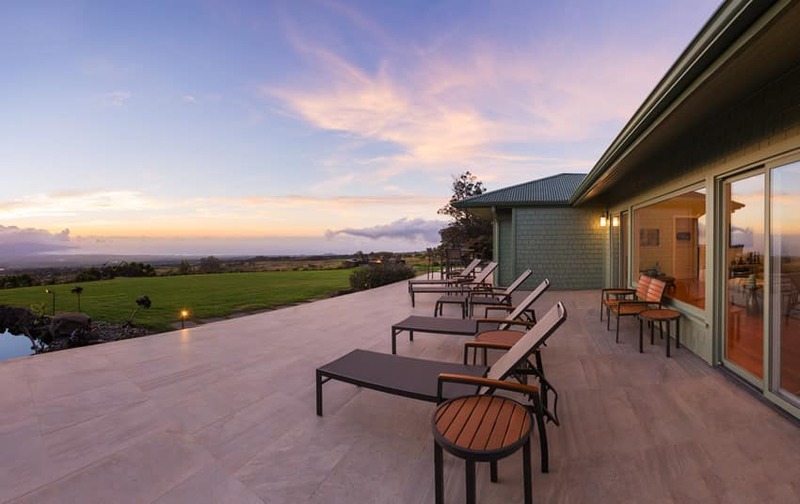 Wraparound Decks – This style allows you to maximize the viewing area around your home and is a great choice when you want to enjoy your views from multiple perspectives. 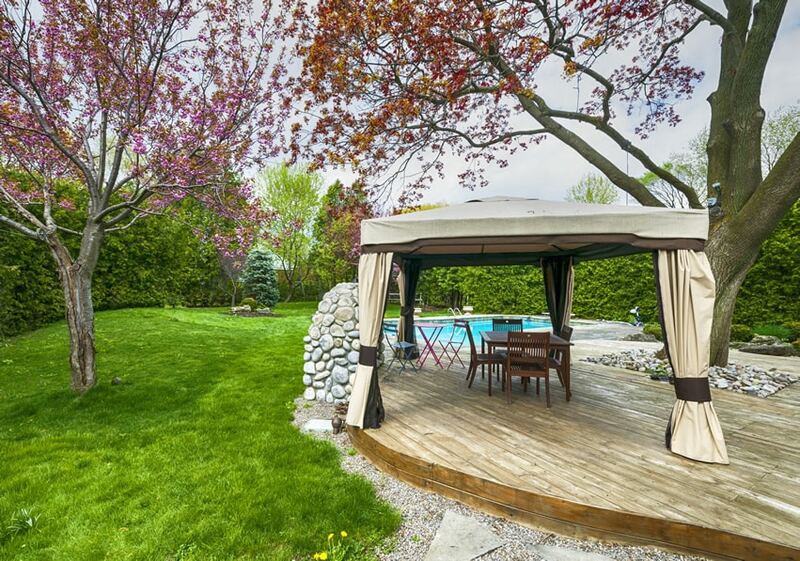 There are many programs that allow you to create your own backyard layouts and plans. Visit this page for a list of popular deck design software you can use to bring in elements such as landscaping, wood platforms, benches and swimming pools to create your ideal backyard. 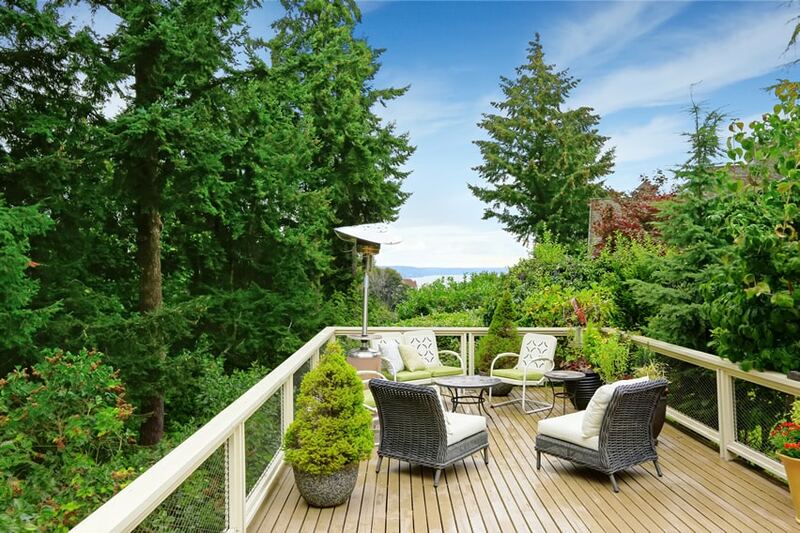 Here are some beautiful wood deck ideas featuring a variety of home designs and landscaping. A small country-inspired patio using wood deck in English Chestnut with white painted wooden balusters and railings. Furniture pieces are treated aluminum with beige powder-coated finish with a folding umbrella for shade. Visit this page for our gallery of patio designs for more ideas. 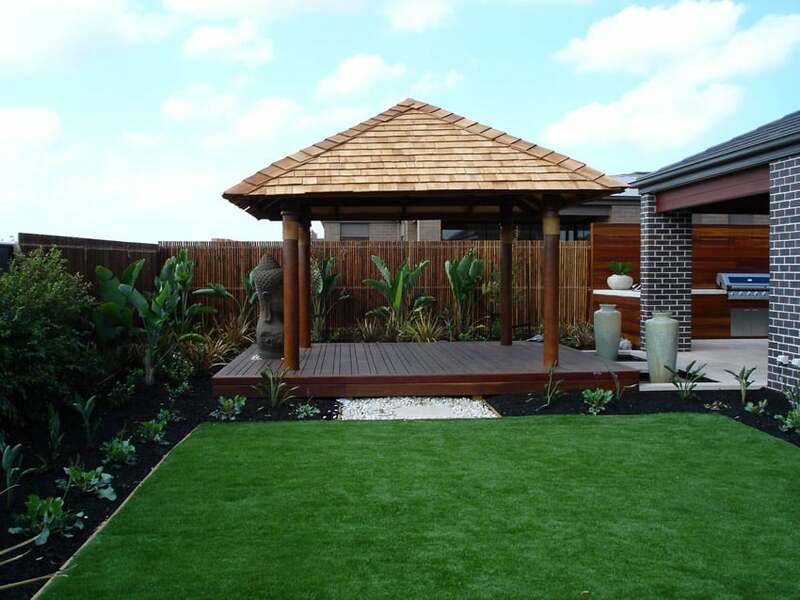 A beautiful gazebo, square deck area which uses multiple-width of Red Mahogany wood decking. 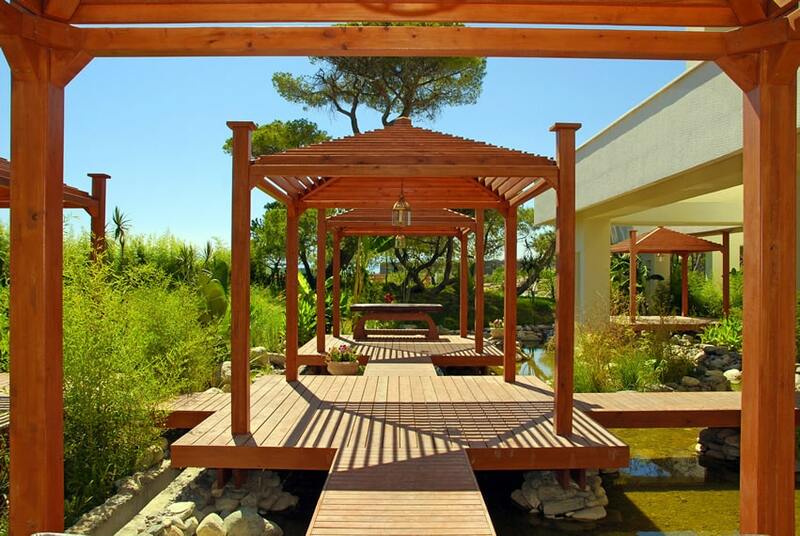 The gazebo roof is supported by wooden columns painted in faux marble finish and the roof uses cream-colored shingles. Wood deck design ideas with gazebos are a great way to maximize your enjoyment in your backyard by providing shade and protection from adverse weather. 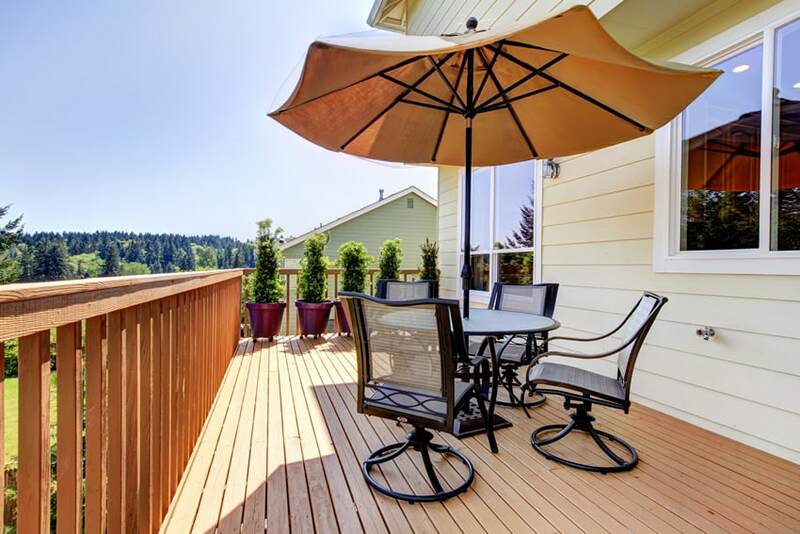 Not only do they increase the amount of time you can spent on your deck they can also substantially increase your home’s resale value. The exterior of the building consists mostly of light yellow and whites, including its furniture pieces. The use of Ebony wood decks in the pool-side area helps make the area stand-out from the rest of the structure. A covered patio which uses Red Chestnut wood deck, complemented by exterior walls clad in terracotta red bricks and white french doors and moldings. The exposed roof supports are also in white and topped with a polycarbonate material. 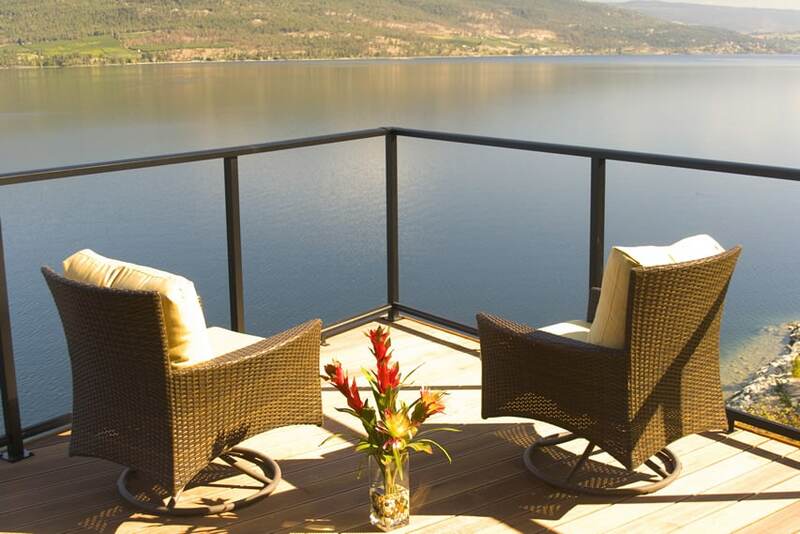 This gorgeous lakeside view is unobstructed in this patio’s clear glass railings with black powder-coated metal handrails. 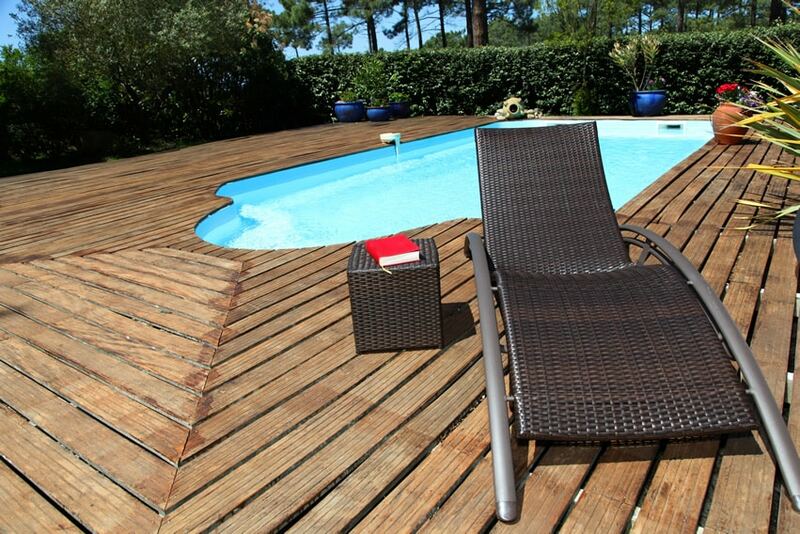 The floors uses Pickled Oak wood deck while the furniture uses a synthetic rattan material. 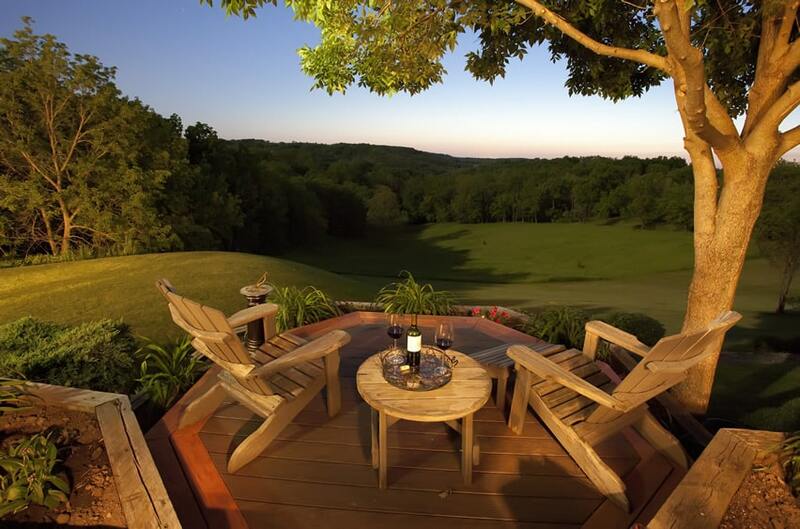 A great view is a perfect canvas for wood deck design ideas that focus around maximizing your seating area and appreciating the vistas. 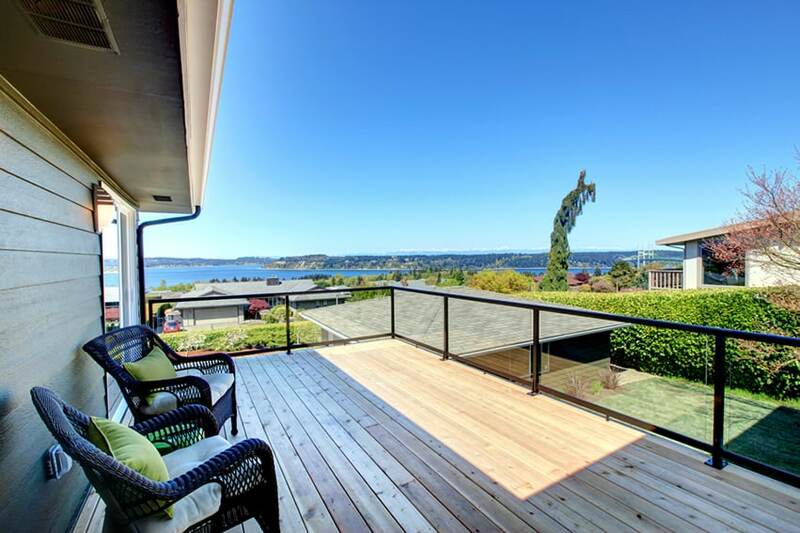 This multi-level balcony deck combines classic and modern elements. The flooring uses PVC wood deck material in a matte Ebony color, while the furniture used has a classic design with swirl patterns, using powder-coated metal in a dark mocha color. This modern minimalist home contrasts its smooth and plain surface finishes with the use of weathered wood deck material which were sanded to achieve a driftwood and matte finish / appearance. Other surfaces are simply of poured concrete or gray colored stone tiles. This octagonal island deck features an outdoor sitting area that uses PVC wood deck floors in a gunmetal color.This is bordered by treated solid cherry wood. The furniture pieces are weathered driftwood Oak, maintaining a rough, sanded finish. This beautiful patio uses gorgeous Oak wood deck flooring, and uses natural tree branches as railings over more polished wood to give a natural barn/cabin look. Furniture pieces are classic wicker furniture and solid red mahogany wood. A simple platform deck and patio area with solid red Chestnut wood deck floors, combined with solid wood furniture in Red Mahogany. All furniture pieces in the area are stained in the same Mahogany tone. This pool area surrounds itself with Solid Weathered Oak with horizontal grooves. The furniture pieces in the space uses synthetic rattan in a dark mocha color, with treated aluminum framing in the same mocha color. 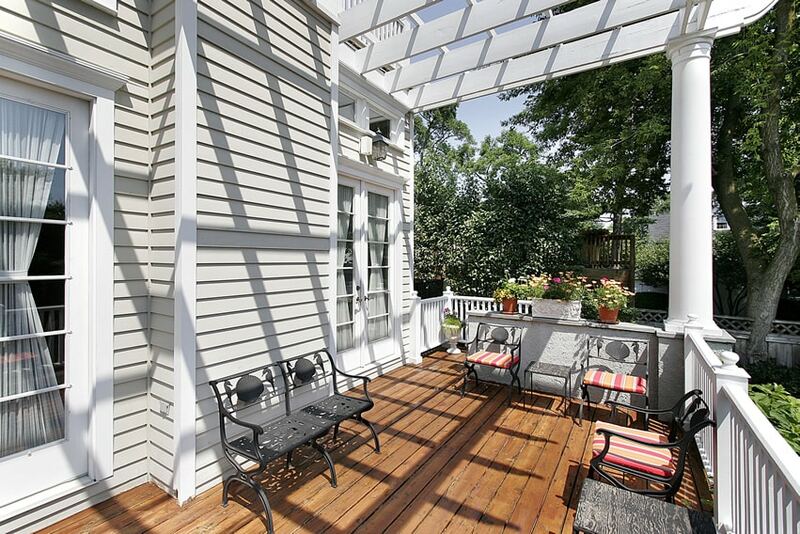 Solid Cherry Wood deck flooring complements the horizontal lines of the solid wood trellis. The area also uses synthetic rattan in natural color and a fireplace area clad with black slate tiles. The modern rectangular fire pit design is decorated in grey slate and features a rust resistant powder coated welded steel frame. This gorgeous wooden stairway uses natural Poplar wood for the whole structure – the steps, its balusters and handrails, as well as its wood decking for the stair landings. Treated Yellow Poplar is often used as a less expensive alternative for outdoor decking. Yellow Poplar studs and posts are generally very straight and can hold up well to the elements. 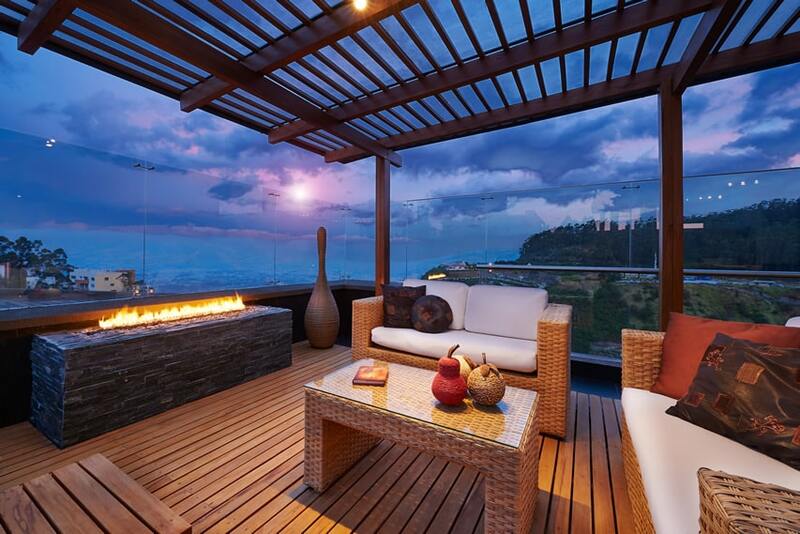 This balcony area mainly uses black ceramic tiles combined with Cherry Wood decking and Red Chestnut solid wood trellis. Furniture pieces uses natural rattan and water-resistant fabrics for its upholstery. 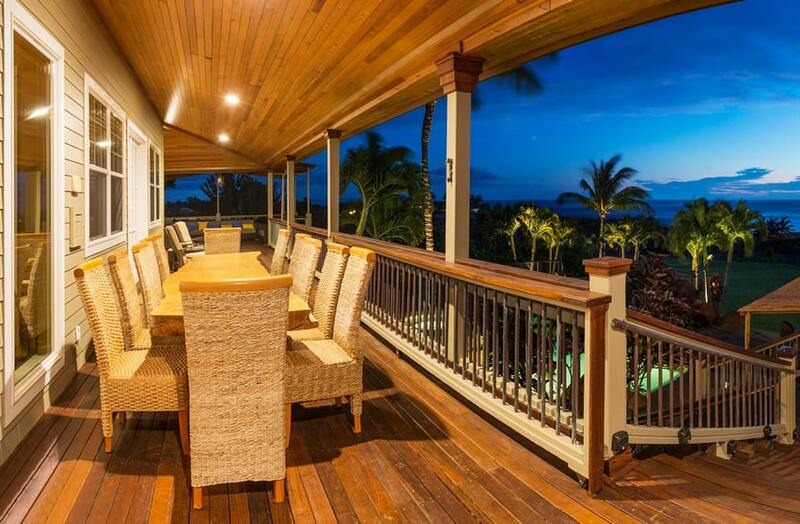 This tropical view patio area uses wood planks in the same orientation for both the ceiling and the floors. While the ceiling uses solid Cherry Wood planks, the floors are covered with darker weathered solid wood deck. A lakeside outdoor dining area with gorgeous Solid mahogany wood deck flooring with matching Teak wood dining set and solid Mahogany wood railings with clear tempered glass for an unobstructed view of the lake. 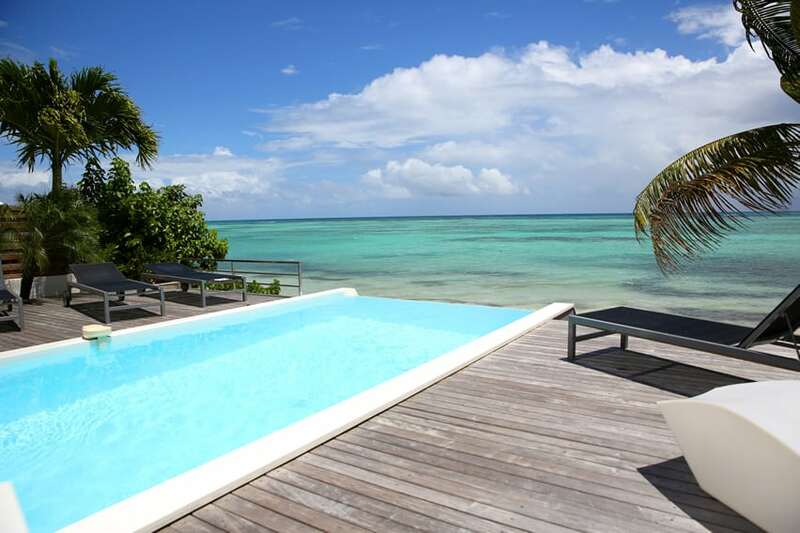 A gorgeous seaside infinity pool area which uses Ash weathered wood deck floors to surround the pool area. 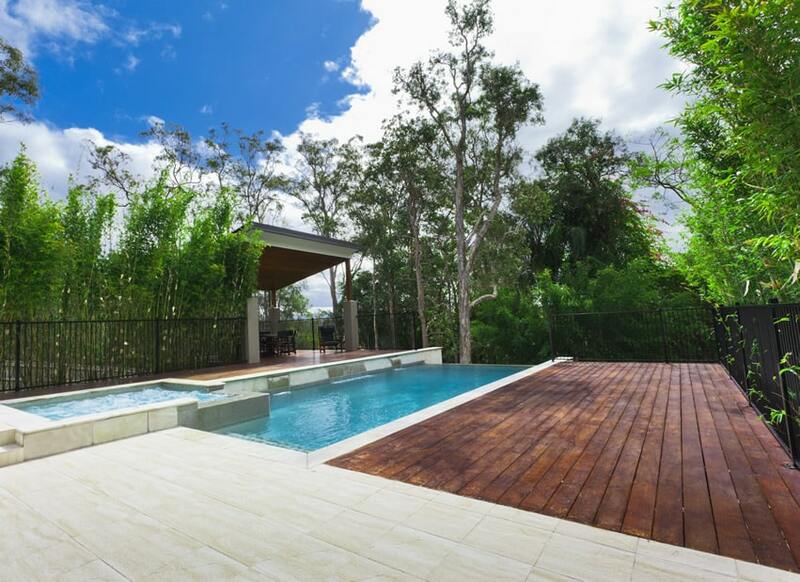 Apart from the wood deck, the pool is also framed by white granite stone to highlight it from the rest if the areas. 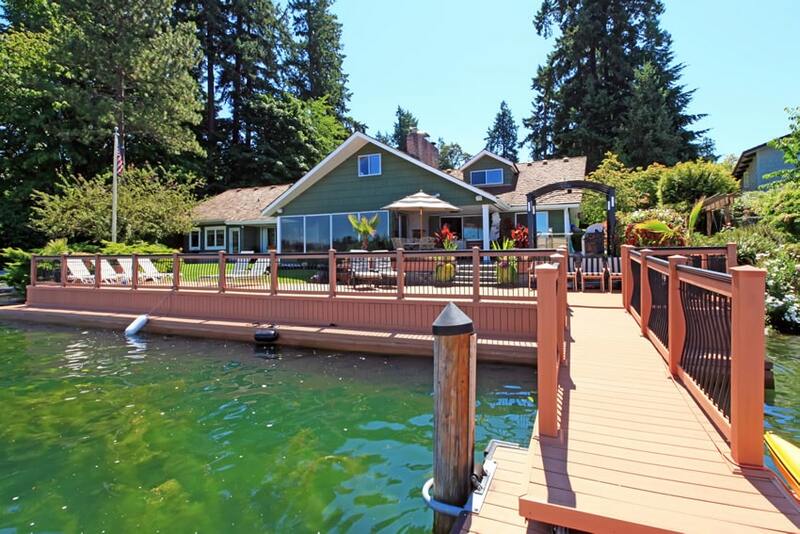 This lakeside home with a dock uses a more practical approach, using PVC deck tiles in a wood color/finish in favor of solid wood for added longevity. The horizontal arrangement of the deck tiles matches the green-painted wood sidings of the house exterior. A raised patio area surrounded by trees and greenery which uses solid weathered wood deck, paired with solid wood Oak railings & balusters. It also has bench made of solid Oak & a small covered bar area. 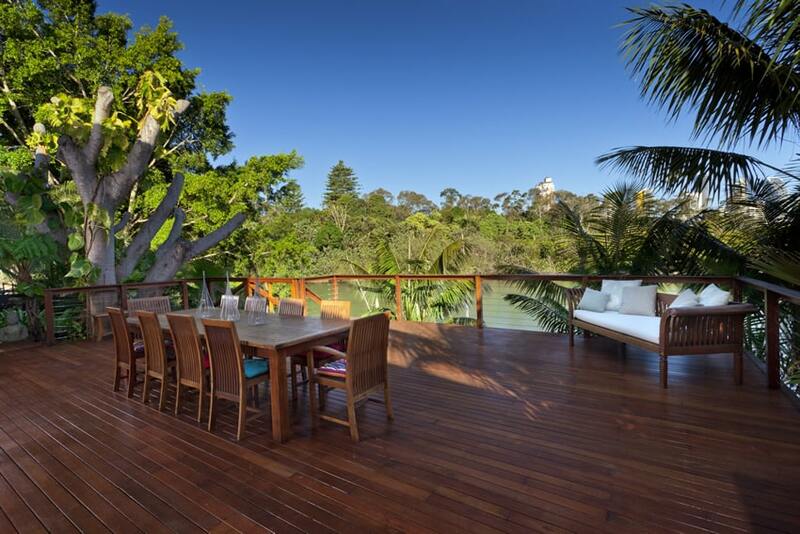 This patio area has gorgeous solid wood deck floors in Teak wood. The exterior of the houses has wood siding painted in a pale green, a matching trellis and white moldings. Rustic wrought iron furniture with bright covered cushions add to the traditional aesthetics on this outdoor space. A modern home which combines modern materials and finishes with the classic weathered wood deck floors. The exterior of the house is simply painted in a cream color and combined with wood sidings in a light gray color. 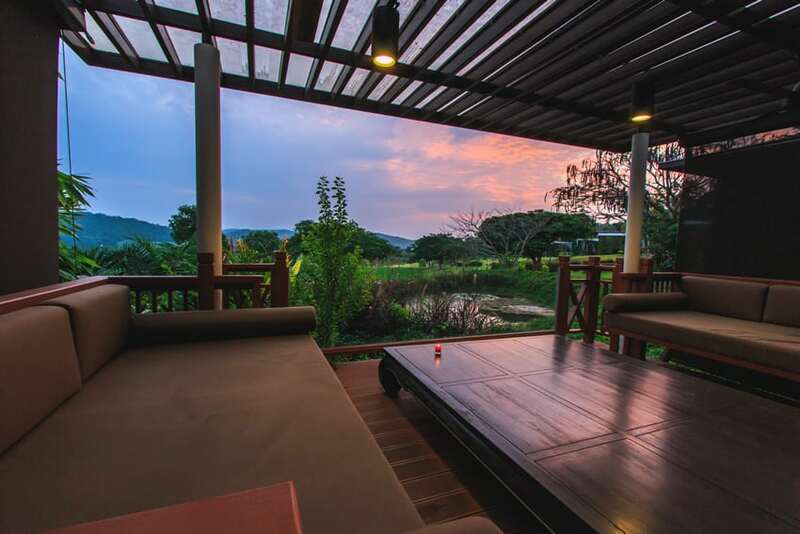 This patio area features a wide and open view of the grass field and lake, while using Ash colored PVC wood deck material for its floors to give it a rustic appeal. The exterior walls of the structure is clad with bricks painted in an emerald green color. A balcony set in a tropical resort which uses solid cherry wood decking floors and solid Mahogany cafe chairs and tables. It has clear glass railings for optimum view and solid wood handrails to complement the floors. 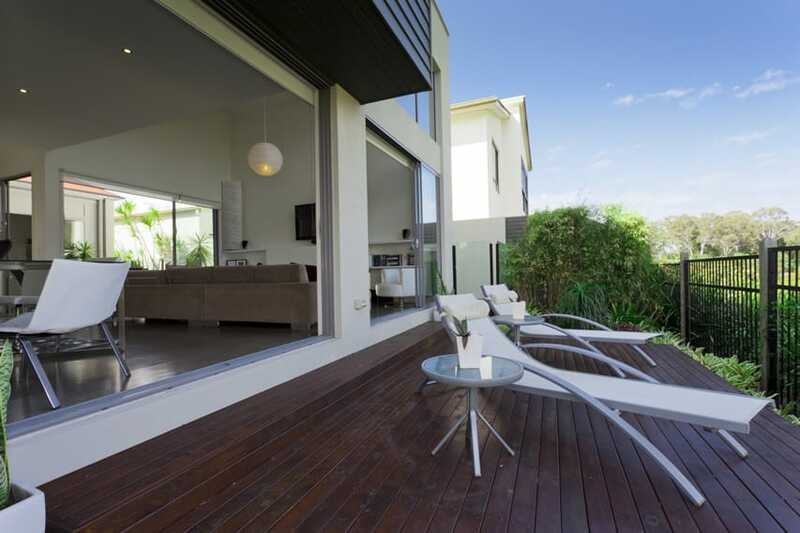 This outdoor lanai combines white porcelain stone tiles floors with solid oak wood deck tiles to cover its floors. Furniture pieces uses synthetic rattan material with black & white striped fabric for its upholstery. A quaint open balcony with a simple and straightforward design approach. The floors uses solid Light Cherry Wood and solid weather-treated Teakwood railings and balusters. Furniture used are treated aluminum in black. 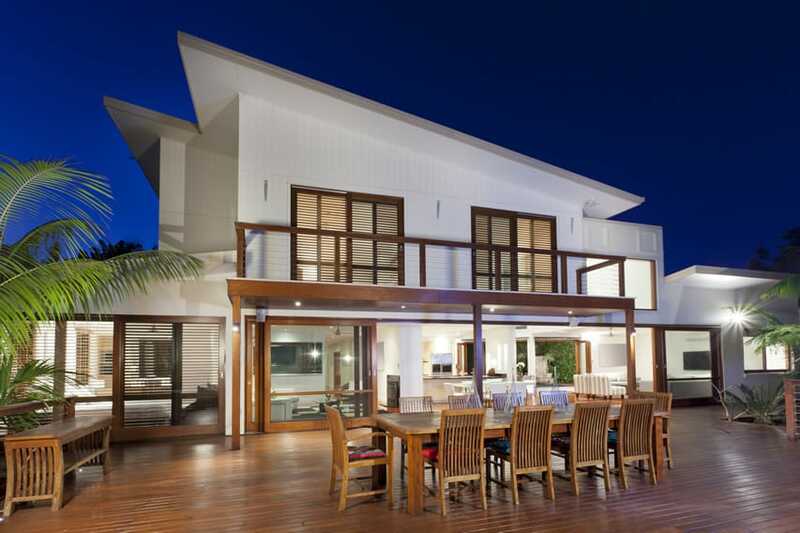 This modern home has an outdoor lanai with lounge area that uses solid wood deck in dark wengue. This material is also used on the pocket veranda. The railings and balusters are of black painted metal, and furniture pieces are molded plastic with treated aluminum framing. 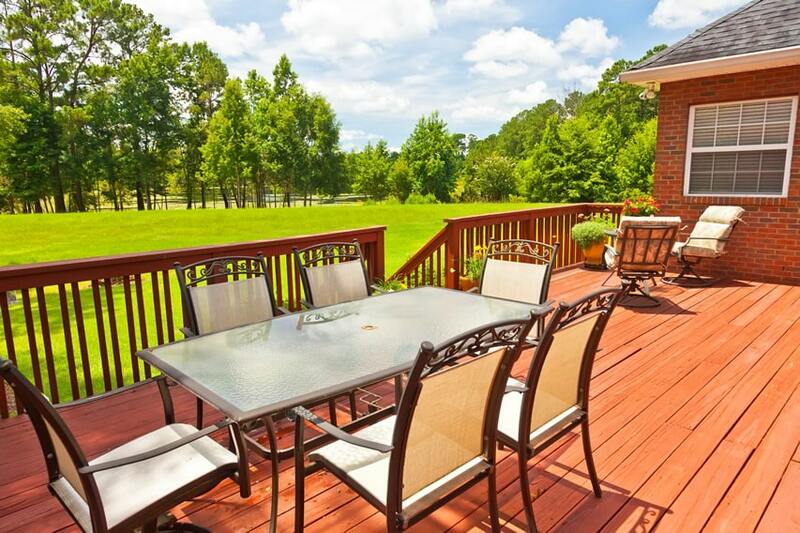 A gorgeous patio dining / barbecue area with solid wood deck in Colonial maple. It has a matching set of balusters, and a wall with terracotta bricks. The furniture pieces are all treated aluminum with glass table top. 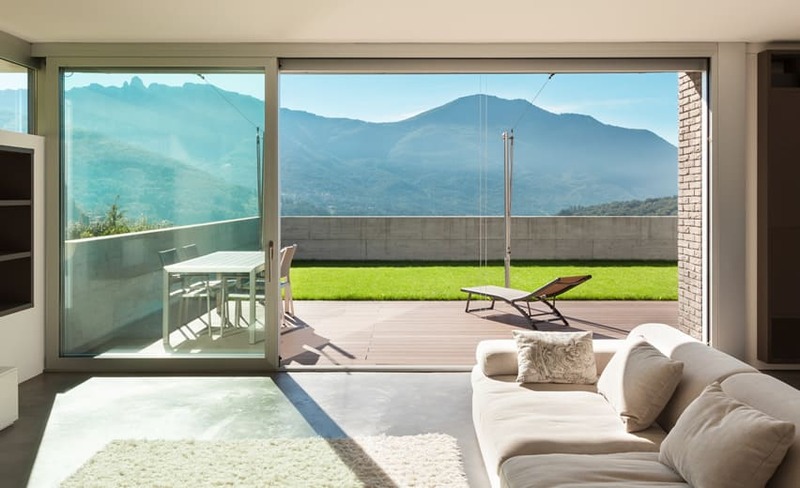 This modern minimalist home has a large open patio with a lounge area. 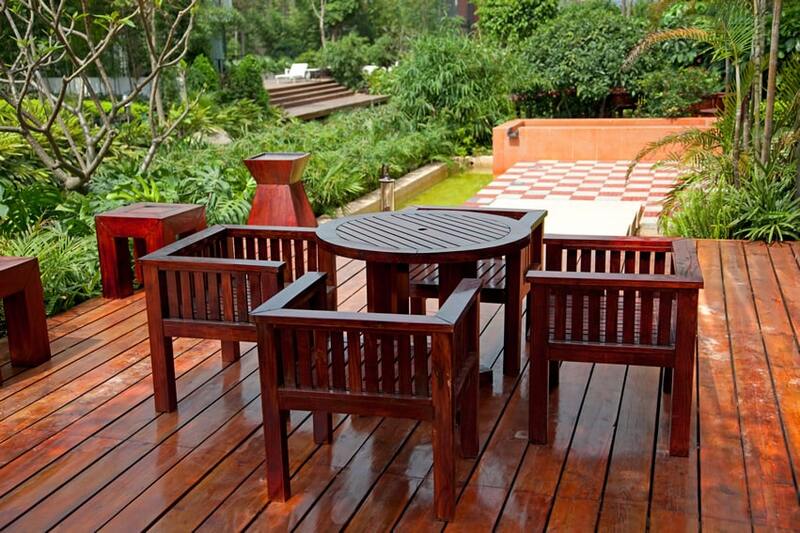 It uses weather-resistant solid wood deck tiles in red Mahogany. The exterior walls of the house has terracotta brick cladding, and the fence is out of raw concrete finish. A large modern patio with solid Birch Wood decking tiles. The railings are simple black square metal bars. 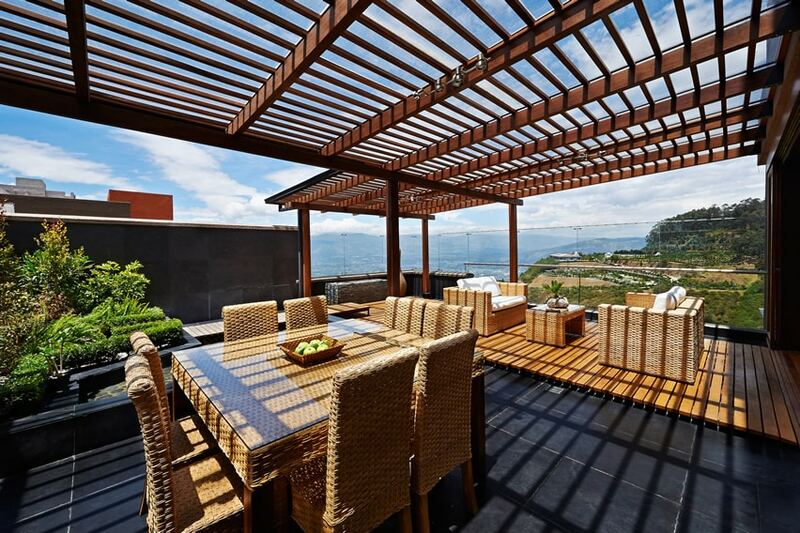 There is a sitting area which uses synthetic rattan and a dining area with umbrella/sunshade. A gorgeous balcony surrounded by trees and greenery. Deck floors are made of solid weathered pine, while railings are solid wood painted in white, with white metal mesh in replacement for balusters. 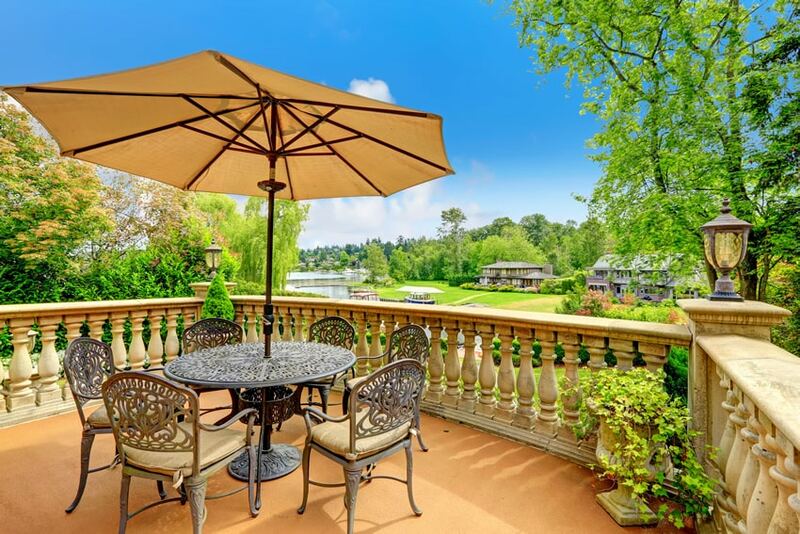 This contemporary balcony features a view of greens and the lake. It has weathered wood deck floors with white solid wood railing / baluster. The walls are clad with vertical wood sidings painted in mocha brown. A large outdoor dining area in the middle of a park/garden which uses solid bleached driftwood floors and wooden balusters painted in brown. The dining area has a simple set of white chairs and brown glass top table. 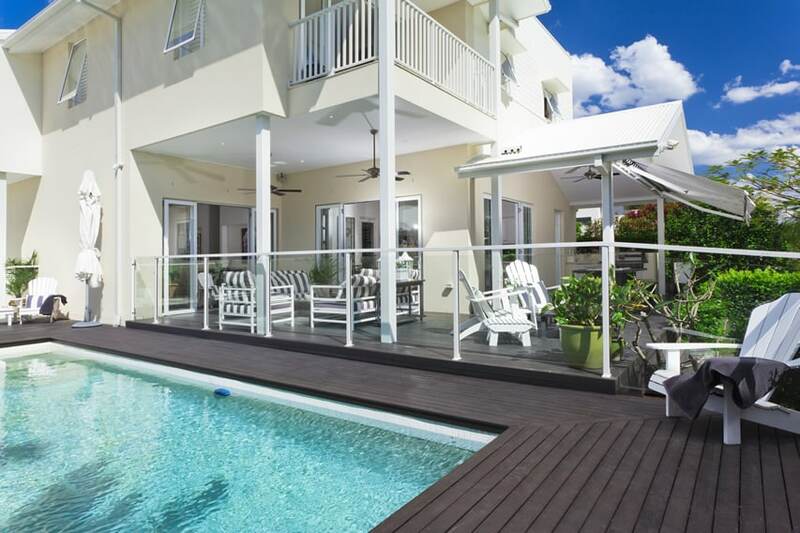 This modern home has a very generous lanai area spanning the area outside. 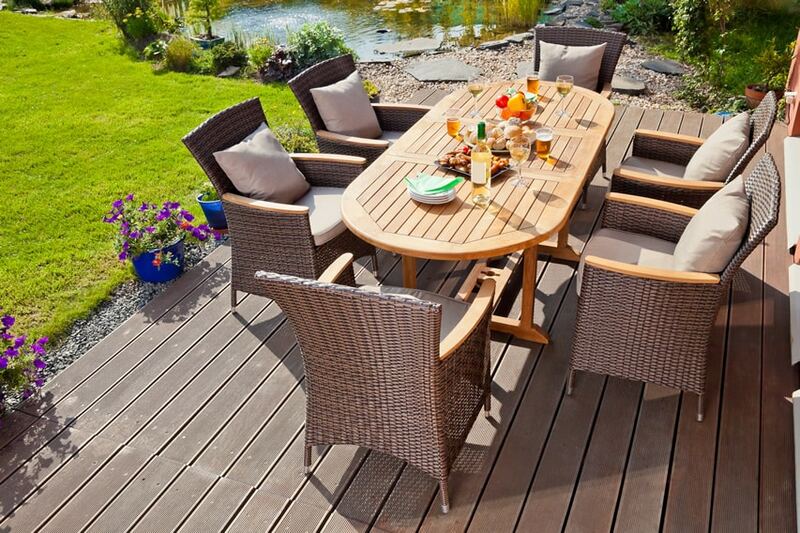 It uses weather-resistant solid teak wood decking with a matching wooden dining set. While most of the house exterior is white, the doors, windows and other architectural elements are also in a matching teak finish. Palm trees and wood finishes continue the tropical theme. 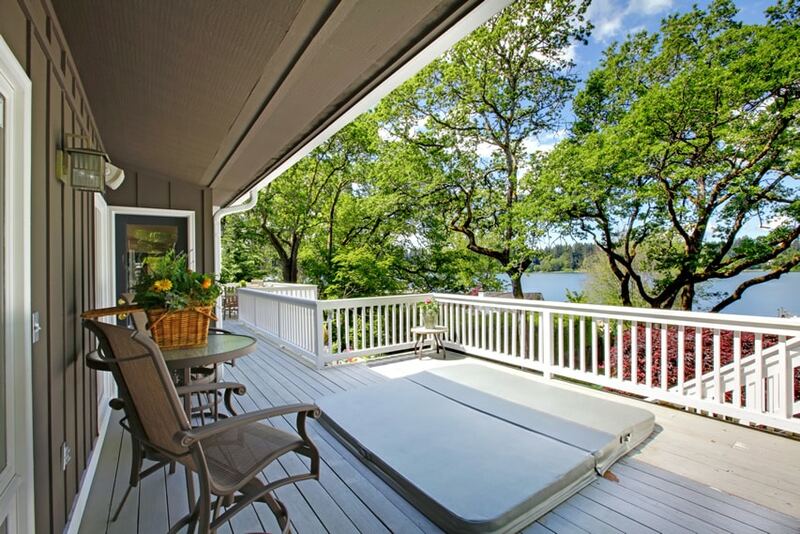 There is an upper deck area exiting from the bedroom to better enjoy the views. An outdoor lanai area of with red Mahogany solid wood decking. The trellis is also of Mahogany, while the exterior if the structure has horizontal wood sidings painted light gray. Furniture pieces are from black treated aluminum with red upholstery. This pool side elevated deck has a small tent canopy for shade and a dining set for barbecue, lounging or other similar purposes. The wood used for the deck is pickled oak to give a rustic appeal. The fireplace area has solid river stones cemented together. This balcony has a classic, elegant appeal. It provides a good view of the garden/park, and provides a sitting and dining area with umbrella for shade. Floors are simply colored cement in an orange, while the light cream balusters are fashioned out of solid limestone. 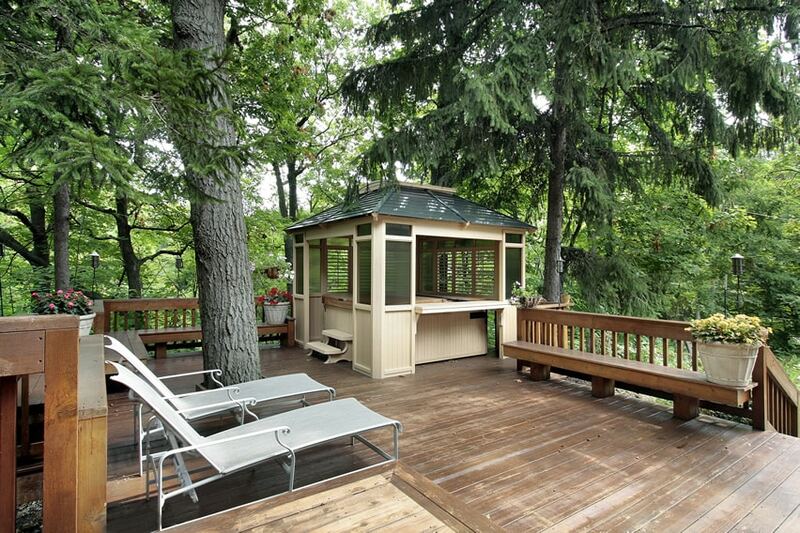 A cabin with a generous lanai space which is surrounded by greenery. It uses weather-treated solid pine wood deck floors. 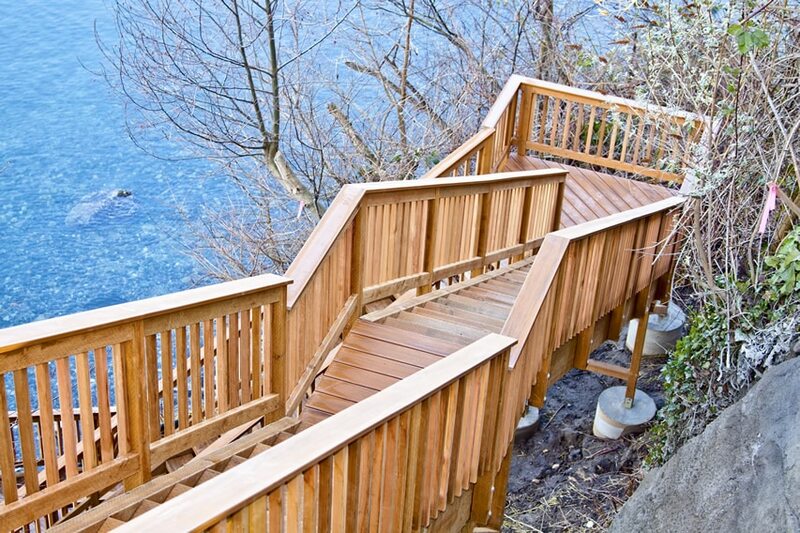 The railings also uses pine, but uses wire cables to replace conventional balusters. 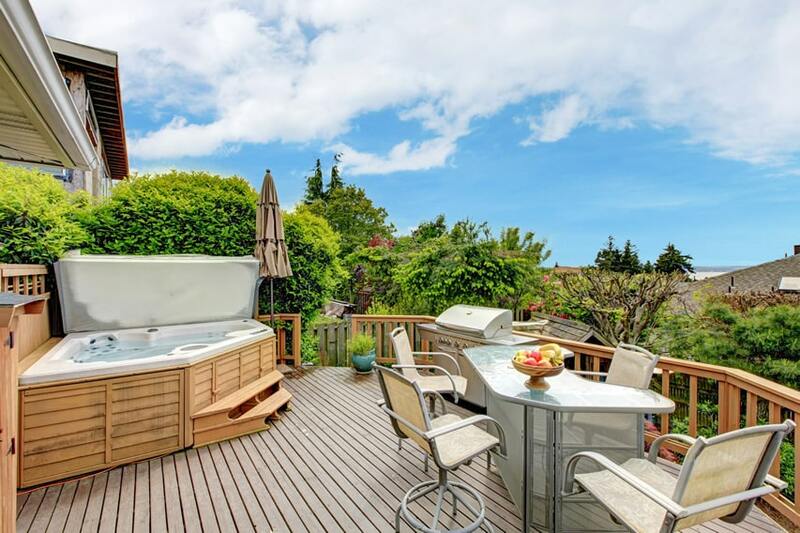 This balcony area provides a space for dining / bar, as well as a Jacuzzi to relax in. The floors used for this space are PVC floor decking in a bleached driftwood color. The jacuzzi and the railings uses matching solid Pecan wood. A lanai which provides a comfortable sitting and dining area, as well as optimum privacy and shade. Floors are PVC with deck tiles in a dark wengue color to match the trellis and dark gray polycarbonate roofing. This swimming pool design uses 2 types of flooring. The upper elevated area uses cream colored porcelain tiles, while the area beside the pool uses weathered solid Mahogany wood deck. 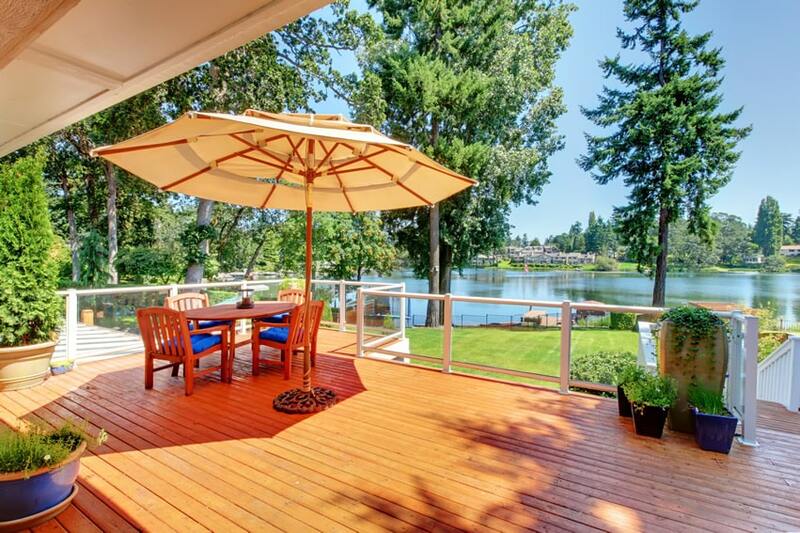 This patio area offers a wonderful lake view and a sitting area to dine and relax. The wood deck floors were stained in a light gray color to achieve an antique finish. Solid wood railings are in a light cream color while doors, windows and other elements are white. 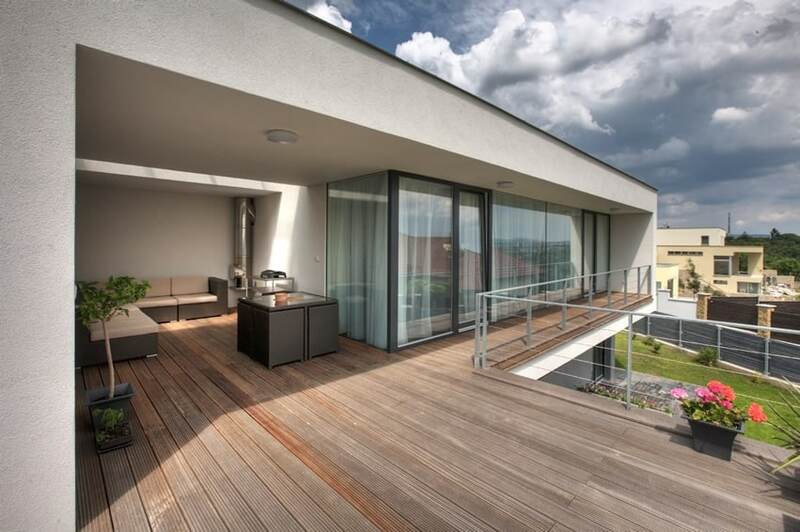 This modern balcony has a wonderful view and a large area to dine and relax. Wood deck floors are in natural Beech wood while the railings are black square tubular metal with clear tempered glass. A beautiful elevated garden pathway decked with PVC Teak wood. The gate arches are made of treated solid teak wood, and surrounding the walkway is a garden water feature pond with river rock and an assortment of plants. 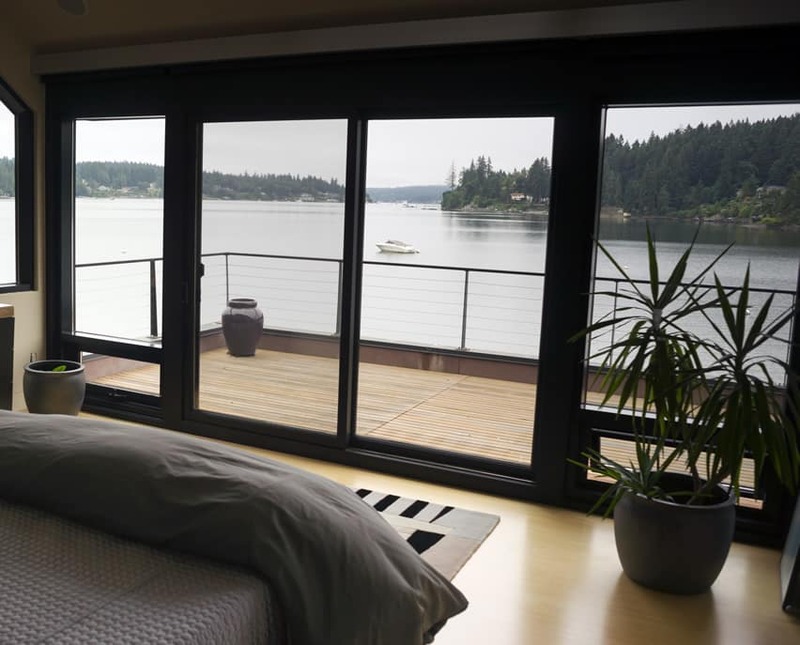 A modern bedroom with a large balcony overlooking the lake. It uses Beech wood deck tiles arranged horizontally, while the room itself uses beech wood laminates. The railings are of black metal bars with metal wires in replacement for balusters. This garden barbecue area separates itself from the rest of the landscaping and water features through its elevated wood deck in weathered walnut. Seating furniture are made of woven rattan, while the dining table is solid Teak. 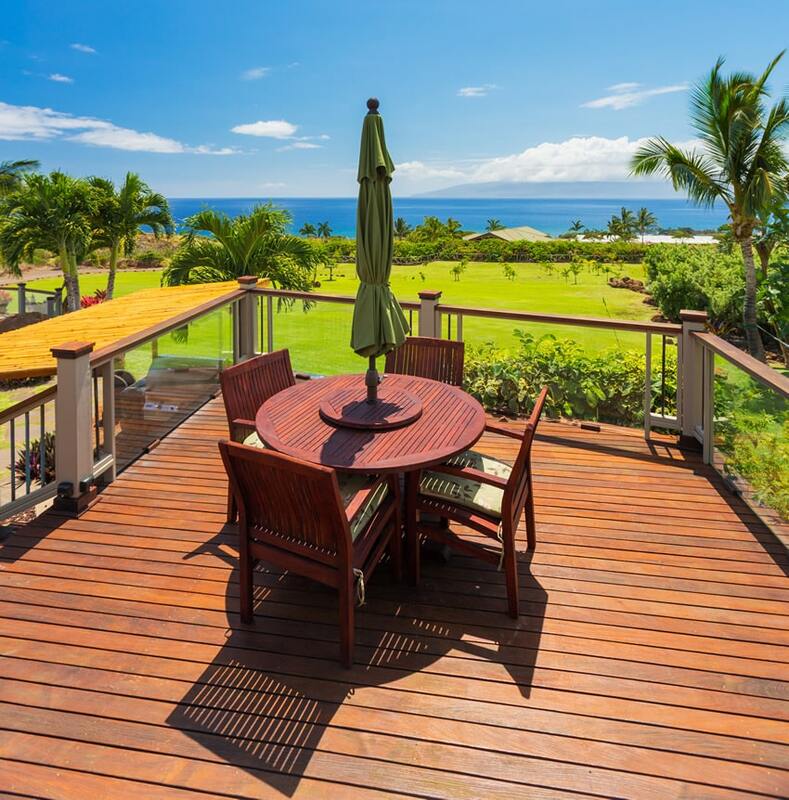 This garden lanai area has an elevated deck using weathered driftwood deck tiles. 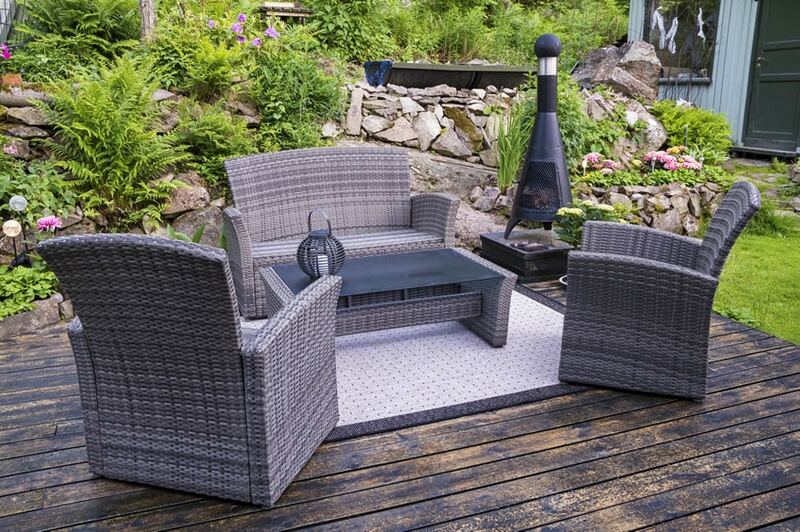 Furniture pieces are made of gray synthetic rattan with a matching gray jute rug. 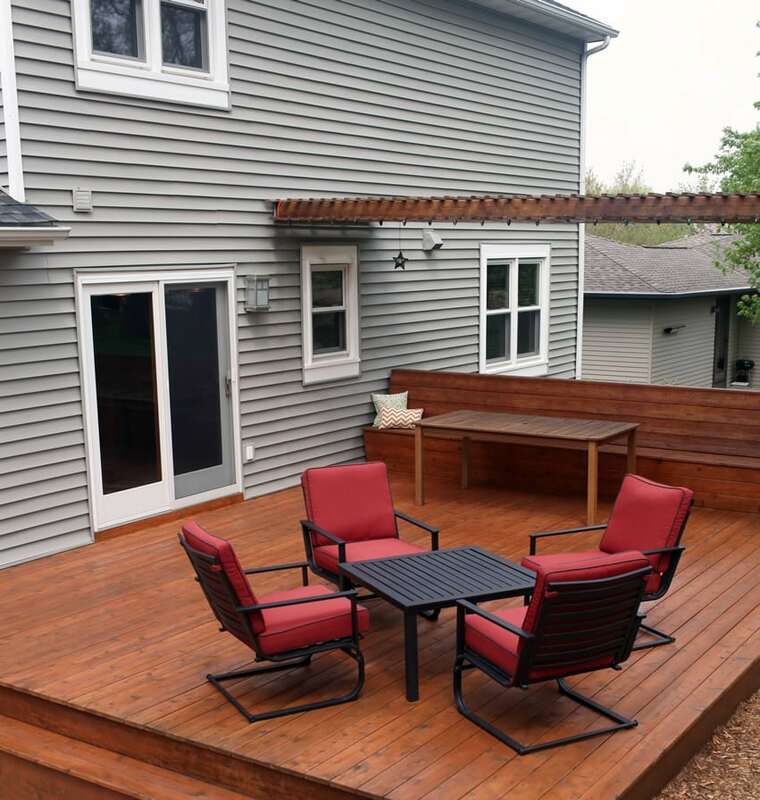 Many wood deck design ideas start with a homes exterior and create a wraparound design to create the perfect environment for enjoying the outdoor areas of the home. 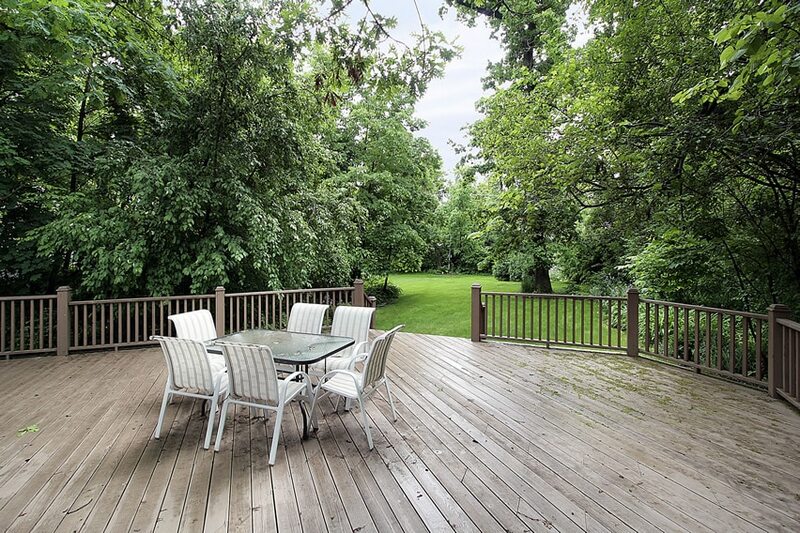 Above is a large garden-side deck with solid wood pickled oak deck floors. It is kept in its natural unvarnished finish to achieve a more rustic look. The balusters and railings, on the other hand, uses Natural solid oak. 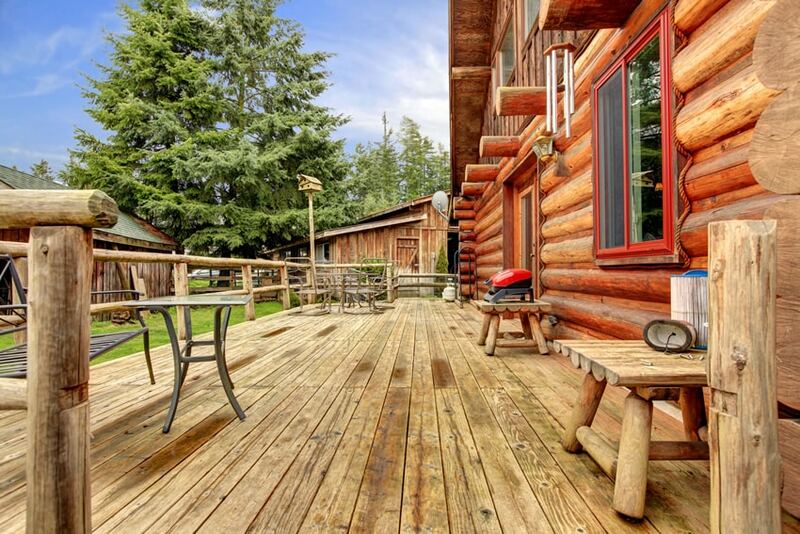 A gorgeous wooden cabin with an elevated barbecue area which uses solid driftwood floors. The railings uses large pieces of non-smoothed timber to match the large timber wood walls of the cabin. 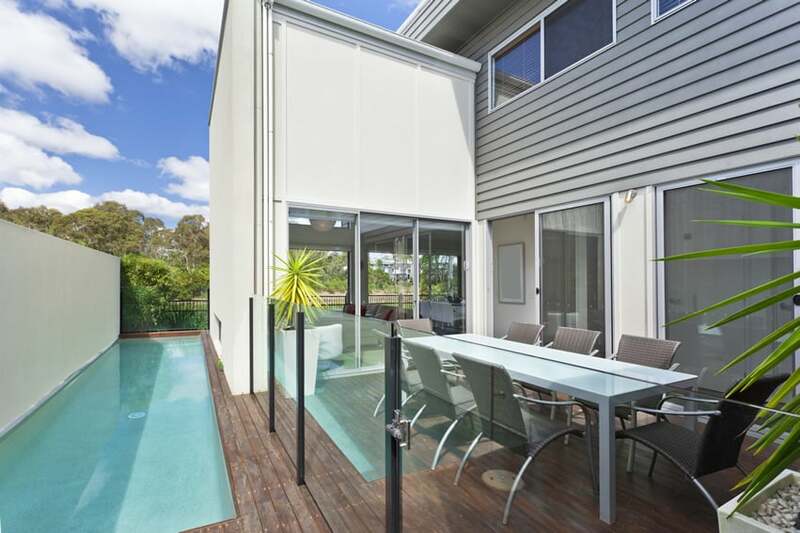 This modern deck design has a large balcony and a shaded lounge area. The decking uses weathered driftwood planks and the railings are tubular metal painted in light gray color. An outdoor couch backs up to the shaded portion of the covered veranda.